Thinking about transferring to Western Michigan University after your time here at Kellogg Community College? Sign up for KCC’s WMU Onsite Admission Day! The best part is: You can accomplish all of these steps at one time while remaining on KCC’s campus! 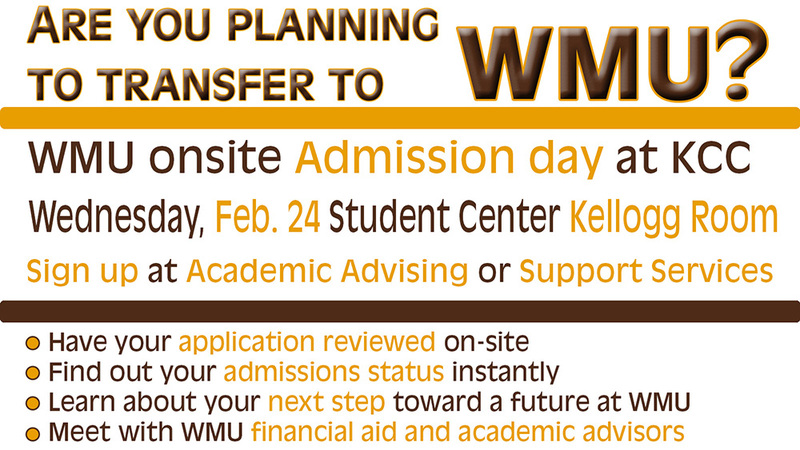 WMU Onsite Admission Day is free, but appointments are required. To sign up to secure your place, contact KCC’s Academic Advising office at 269-965-4124 or contact KCC’s Support Services office at 269-965-4150.